how to read the break of a putt at the same time. A good putting drill to learn the different direction the ball breaks on a sloping surface. As you move clockwise around an imaginary clock, you will see that your ball breaks in different directions. Phil Mickelson has on occasion used this drill and then incorporated part of it in his pre-putt routine when faced with a short putt. You may have observed that he takes a practice putt to the side of where his ball is located. He then moves around to his ball and putts. What he is doing is imagining that his real putt is just another putt in the Clock Drill that he has practised over and over. It is his way of taking the pressure off. Visualise the hole as a CD disk that is tilted up slightly. On the rim there will be a single point that is higher than any other point. The highest point is the 12 o'clock station and the lowest point the 6 o'clock station. The line joining 12 o'clock to 6 o'clock is known as the Fall Line - the true downward direction of the slope through the hole. As you work your way around the hole, there will only be two putts in the sequence of 12 putts that will be absolutely straight. The two straight putts will be a straight uphill putt and a straight downhill putt. Both are on the Fall Line. All the remaining 10 putts will have some break to them. You can use this information to help you read the break if you know what to look for. 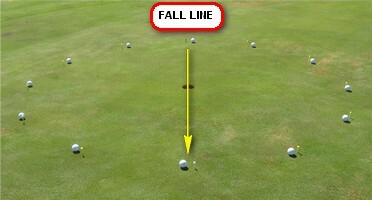 Every putt to the left of the Fall Line will break left to right. This is true irrespective of whether you are putting slightly uphill or slightly downhill. Here is a suggestion for getting more value from the Clock Drill. You will need 12 tees or plastic ball markers. 10 of the tees should be yellow, and the remaining two should be red and white respectively. Pick out a hole and place the 12 tees in a circle about three to four feet from the cup. These are the 12 positions on the clock face. Now try to identify the highest point on the cup and use a red tee to indicate 12 o'clock station and the white tee to indicate 6 o'clock station. This is your best guess at the local Fall Line through the hole. Start your sequence of putts. Very soon you will see by the way the ball breaks if you were correct in finding the Fall Line. Stop putting and change the position of the red and white tees. After a few attempts you will find the true Fall Line where your ball position is either straight uphill or straight downhill. Now continue with your putting practice and observe how each ball breaks. The secret of reading putts is the ability to pick out the local Fall Line and adjust your aim according to the direction of the break. Because of today's closely mown surfaces, the slope on most greens is more subtle. It is no longer easy to see the true downward direction of the slope around the hole. You need to train your eye. Putting Round the Clock as a practice drill can therefore not only help you to practise your short putts, but also help you to improve your ability to read the break.